In first footage of ISIS attacks on French capital, diners and restaurant staff can be seen scrambling for cover as gunman sprays bullets. The Daily Mail published on Thursday horrifying video footage of the shooting at a pizza restaurant the night a string of coordinated terror attacks struck the French capital. 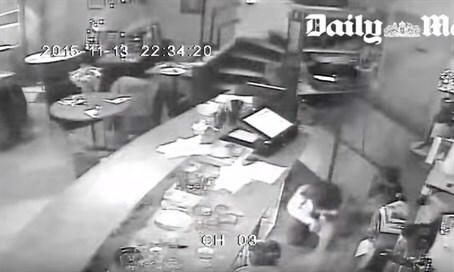 Three CCTV cameras inside the Paris restaurant record the terrorist drawing his AK47 and shooting dozens of bullets at restaurant staff and patrons, leaving the pizzeria engulfed in dust and shattered glass. One woman was saved from certain death after the terrorist's rifle misfired and she had the chance to run away and hide. Footage also captured a 20-year-old waitress hiding under the bar with her arms around an older, injured woman as the gunman continued to spray bullets into the restaurant. The Daily Mail reported it had reason to believe the terrorist responsible for the shooting is 26-year-old Belgian born Salah Abdeslam, who evaded capture after the attacks and remains at large. While none of the diners or staff inside the restaurant were killed in the attack, several others on the street were murdered before the gunman fled in a black Seat getaway car. The footage is the first time any film has been seen documenting the murderous attacks claimed by Islamic State terrorists.